Gold prices have been lower after hitting a high of $1296 per ounce following the Chinese trade balance miss overnight. Looking ahead, there are plenty of risk factors in play this week and the main event will be Brexit with the PM's deal going to the House of Commons today for a vote. On the other hand, this week will be a busy schedule for Fed speakers again before the blackout phase ahead of the January 30 interest rate decision. However, the dovish tone expected will unlikely give us much to go on and the Dollar will likely remain under pressure, offering gold upside potential. 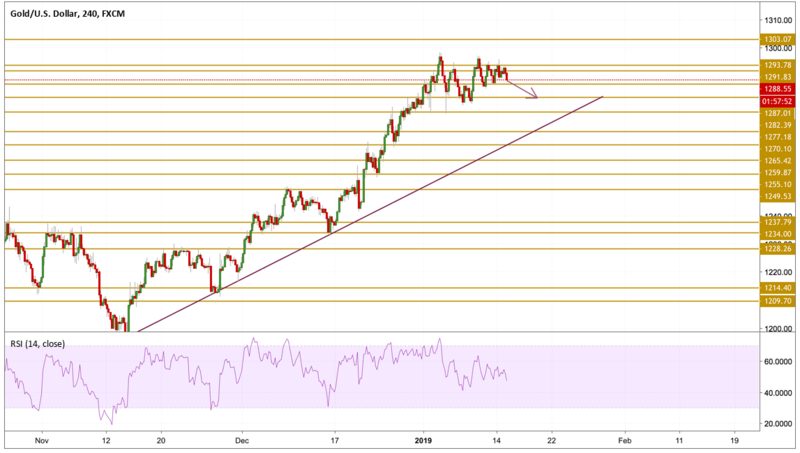 Gold prices clearly entered a consolidation phase as the price action became limited between the $1285 level and previous tops. The price has broke the $1290 level to the downside and is currently hovering above the $1287 support level. Momentum is starting to turn bearish so we will expect a downward move on the short term with the the $1282.39 level in focus however our view on the longer term will not change and the $1300 is still our bigger target.